Chemical Guys V36 Optical Grade Cutting Polish is the great all-around cutting-polish that eliminates light to moderate paint defects and imperfections from all paint types, then finishes like a fine polish. V36 is formulated for fast cutting with optical grade diminishing abrasives that restore both old paint finishes, and freshly-painted panels. The advanced polish cuts through light and moderate paint defects, swirls, scratches, and oxidation, then finishes with superior luster fit for final polish results on most paints. V36 Optical Grade Cutting Polish is the first cutting-polish that works on scratch-resistant and ceramic clear coat finishes. The diminishing micro abrasives work fast with true-cut accuracy; there are no fillers, so the results you see are the true results you get. The optical-grade abrasives quickly remove 2000-2500 grit sanding marks and moderate defects and scratches. V36 delivers fast cutting power with fewer passes to quickly restore conventional clear coat, ceramic clear coat, and traditional single stage paint finishes. V36 is the preferred finishing polish for repairing optical plastic after wet-sanding and compounding faded and hazy headlights and taillights. 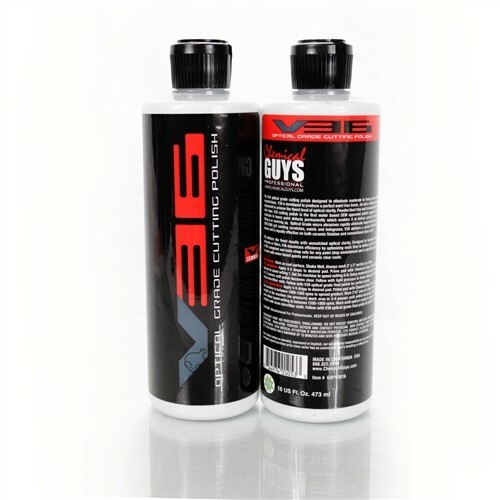 The water-based formula is blended with advanced lubricants for extended worktime and a minimal dusting profile. Use Chemical Guys V36 Optical Grade Cutting Polish to remove light to moderate defects, swirls, and scratches from any paint finish. Rotary Application: Apply 4-5 drops to desired pad. Prime pad with Chemical Guys Pad Conditioner. Set machine to between 1000-1500 rpms to spread product. Work in 2’ x 2’ section at a time. Using just the weight of the machine (no pressure) work area in 3-4 passes until compound becomes clear. For final pass adjust speed setting to between 1200-1800 rpms. Work until optical clarity is achieved. Remove residue with clean microfiber cloth. Follow with V38 Optical Grade Hybrid Compound for perfect clarity.